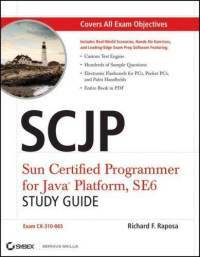 Book Description This book is a must-have for any Java programmer, and is a prerequisite for Sun’s specialty certifications. This resource is essential preparation for the SCJP and focuses heavily on the skill set that Sun expects its SCJPs to have, with numerous examples, exercises, and real-world scenarios to give readers the tools needed to use what they learn. The material covers declarations, initialization, and scoping; flow control; API contents; concurrency; object-oriented concepts; collections/generics; and fundamentals. Richard F. Raposa, SCJP, SCJI, is President of JLicense, a Java Training Center in South Dakota. He has taught Java all over the U.S. for the past ten years and developed hundreds of courses in Java, C++, Visual C++/MFC, Win32 internals, UML, and other object-oriented topics.